Peppa Pig is a children's show that consists of many different, 5 minute, episodes. 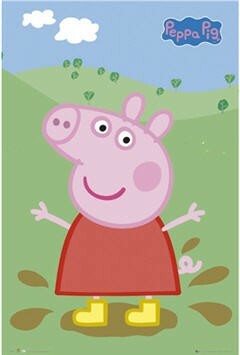 It revolves around the life of Peppa, a young anthropomorphic girl pig, and her family and friends. Each of her friends is a different species of mammal, each of which has a first name starting with the same letter as the type of animal they are (which is also their surname). Peppa's friends are the same age as her, and Peppa's younger brother George's friend Richard is the same age as him. Episodes tend to feature every day activities such as attending playgroup, going swimming, visiting their grand parents, going to the play ground, riding bikes, etc. The characters all wear clothes, live in houses, and drive cars, but still display some characteristics of the animals on which they are based. Peppa and her family snort like pigs during conversations and also like to jump in muddy puddles. The other animals also make their respective appropriate noises when they talk, with some exhibiting other characteristics, such as the Rabbit family's fixation with carrots. The Rabbits are also the sole exception to the rule of human-like habitation, in that they live in a burrow in a hill, although it does have windows and is furnished in the same way as the other houses.